Drop-on-demand piezoelectric inkjet printing represents nowadays one of the most diffused technologies thanks to its high performance and reliability. To achieve high quality printing many different requirements have to be met in terms of drop properties, leading to a very precise dot positioning and thus to a high quality final image. In industrial application many complexities are introduced, e.g. the need for a moving substrate and the request for higher and higher line speeds. 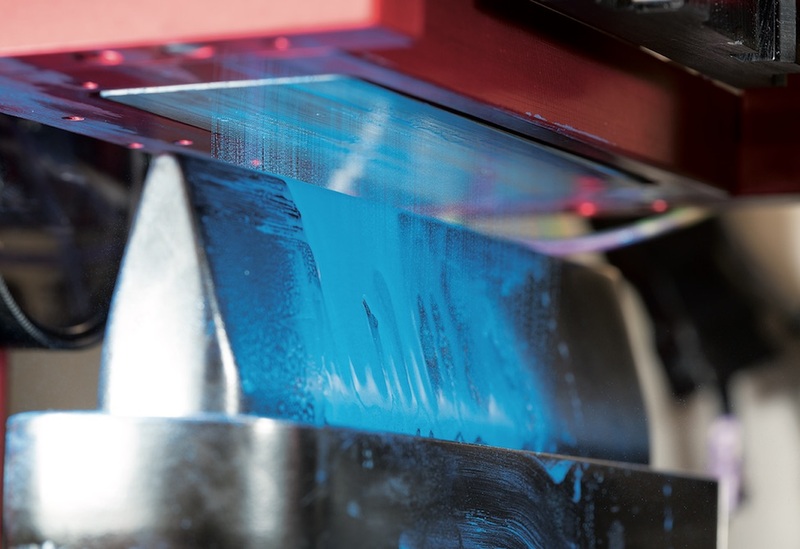 The satisfaction of industrial efficiency, without affecting printing quality and process reliability is a hard task, as an excellent knowledge of involved devices and technologies are required, as well as deep knowledge of ink properties. In particular a wide understanding of the role and interaction of inks and printheads in drop formation is fundamental to gain good control of the whole process. One of the most crucial properties is drop velocity: a high precision in dot positioning especially when it is necessary to work at higher distance from the substrate, requires a high drop speed; a fast drop is also less affected by positioning errors due to a high line speed. To obtain an excellent printing quality it is also fundamental to reduce satellite number or alternatively have them travel fast enough to reach the main drop before landing on the surface. Satellite speed depends only on rheological ink properties; drop speed depends on ink and printhead properties, but can also be varied by adjusting firing conditions such as firing pulse. The faster the drop is, the harder it is for satellites to make the junction during flight. High printing quality is aimed at achieving the right compromise between the need of a fast drop for a good dot positioning, and the reduction of satellite number to minimum. A deep analysis of drop formation is thus required to gain an excellent knowledge of the relationship between the different factors leading to the final result. Many studies have analyzed drop dynamics from both an experimental and theoretical point of view, considering the different stages of drop formation; however, an accurate description of the relationship between drop speed and satellites dynamics is still missing. This relationship is fundamental not only to comprehend the system, but also to evaluate the best working conditions in industrial application in order to reach the goal of a high printing quality. In this study the relationship between the fundamental properties of the application is described taking into account a standard model, suitable to any system. The model is verified through experimental analysis of different printheads-ink combinations. The generality of the model and its perfect match with the experimental data allows to introduce a parameter to evaluate printing quality in advance simply considering ink rheological properties and printhead nozzle size. A general and user-friendly procedure is finally proposed to modify ink properties to improve printing performances. by Ilaria Valenti and Paolo Casarini, Research and Development laboratory, System S.p.A., Italy. Further details of this work will be presented by Dr Valenti at the IMI Europe Inkjet Development Conference, 17-18 April 2018 in Frankfurt, Germany.